Welcome to Beech Ridge Farm. Our foremost goal is to provide you and your family a long-lasting memory of a wholesome family experience. – Only minutes from the Maine Mall, the Maine Turnpike (Scarborough-Exit 42) or Route 295.– We are unable to process credit or debit cards. 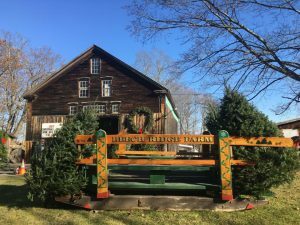 Please bring cash or checks.– The barn has pre-cut trees and is open from 9:30am to 4:30pm, Saturday and Sunday ONLY.– Sorry, we are unable to offer choose-and-cut until further notice, but hope to have the fields open again in 2019.– We close for the season once we’ve sold our selection of trees. Please call first if you are in doubt. Maine turnpike Exit 42. Turn left. Travel to the first traffic light. Turn left onto Holmes Rd. Proceed 2 miles to a 4 way stop (blinking red light). Turn right onto Beech Ridge Rd. The farm is located 3/10ths of a mile on the right.